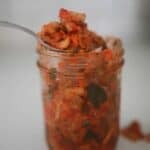 Learn how to make homemade Kimchi. Kimchi is super delicious and full of probiotics. Reserve a few outside cabbage leaves to use for pushing the kimchi below the brine. Chop and grate all the vegetables and add them, with the rest of the ingredients, to a big bowl. Massage the ingredients together, so that the salt causes the cabbage to sweat, and make a brine. Let it all sit for a few minutes. Let everything to get nice and juicy. Pack the mixture tightly into mason jars. Fold up a cabbage leave, that you saved earlier, and use it to keep all the veggies down below the brine. Also use some kind of extra weight to keep it down such as a few rocks in a ziplock bag. I always like to top of my ferments with just a little bit of water to make sure everything is good and submerged. Use mason tops Pickle Pipes as lids. Let it sit out for about five days. Take the rings, plastic wrap, weight and folded up cabbage leaf out. Replace with the regular mason jar lids, and store in the refrigerator.